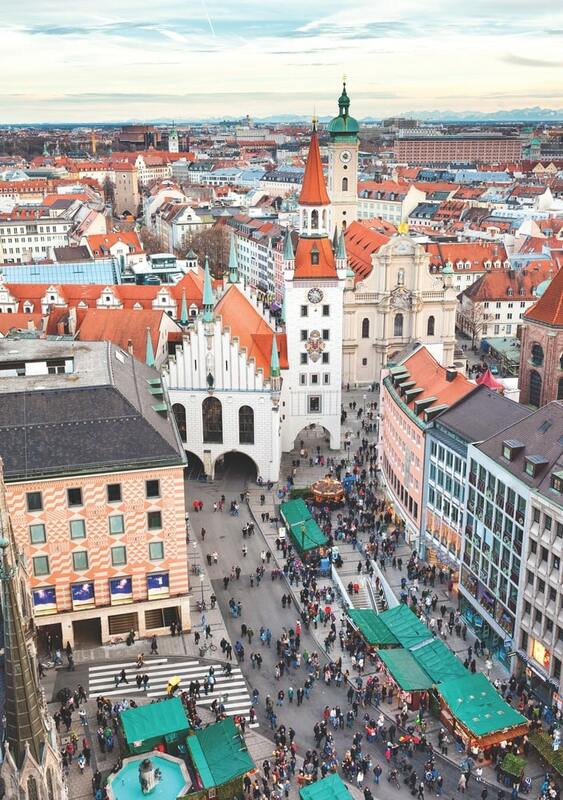 Often used by travelers as a layover point, Munich is a must-see destination in itself. Adrenalin replaces jet lag as I fly above Germany’s third-largest city. My arms are getting tired from my death grip on the rope keeping me from plunging a hundred feet to the ground below. I’m at Olympiapark München experiencing the Flying Fox, the six-hundred-foot-long zip line that soars above the eighty-thousand-seat stadium that was built for the 1972 Summer Olympics. As many times as I’ve had a layover in Munich, I’m leaving its airport for the first time to explore this cosmopolitan and storied city. Two days of my itinerary will be to explore Munich before heading north to Berlin—a plan made possible thanks to Rail Europe’s new high-speed ICE train connecting the two cities with an almost four-hour train ride that speeds passengers along for the 363 miles station to station. I’ve started by taking S-Bahn electric trains from Munich Airport through the heart of the city to Olympiapark München. 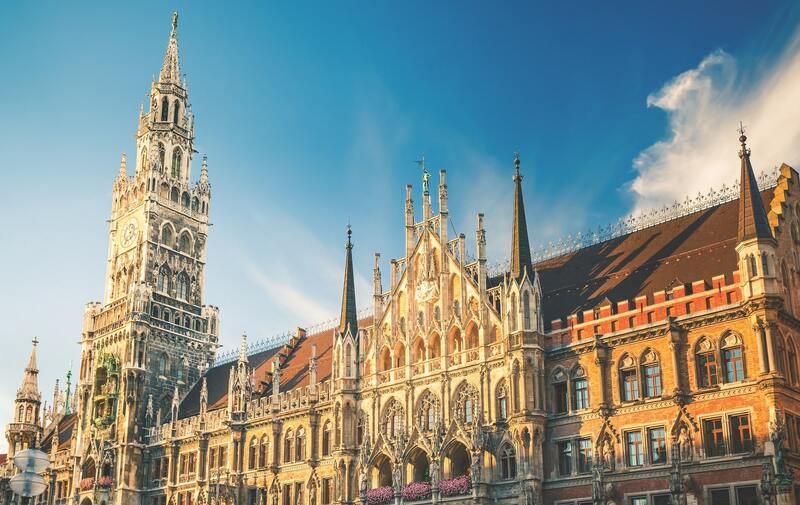 Be sure to stroll the Marienplatz for shops, food stands, and souvenirs, and look up to view the famous Zodiac Clock Tower on the facade of the old town hall. The Olympic complex is symbolic of this at-once modern and historic city. Built on a hill made from the debris of the Second World War, the park has a modern design that speaks to the change that Germans demanded after the horrors of 1940s fascism and then Germany’s Communist division during the Cold War. It strikes me as perfect that freedom and individuality are celebrated atop the nearly one-thousand-foot Olympic Tower where there is a rock-and-roll museum featuring instruments played by such groups as Queen, Pink Floyd, and the Rolling Stones. Safely back on terra firma, I walk fifteen minutes to BMW Welt and the BMW Museum that details the iconic Bavarian Motor Works. The striking BMW Museum is round and silver, tapering to the bottom like a cup. 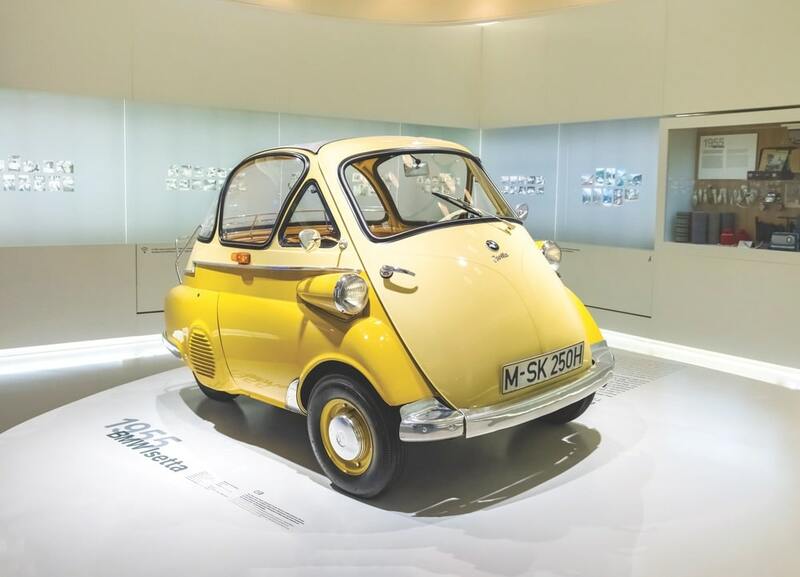 Visitors follow a spiral walkway through decades of BMW innovation, from its first 1916 motorcycles, airplane engines, and delivery trucks to its latest experimental electric race cars. I’m particularly taken with the sleek styling of the 1936 BMW 328, the red 1956 503 Coupé, and the odd, egg-like 1955 BMW Isetta. It looks strange but did eighty miles to the gallon. The 1961 BMW 700 RS stops me the longest, and though I’m not a car guy, I find myself really wanting a BMW. Inside BMW Welt next door, I can’t swing a new Bimmer on this trip, but I do indulge in a lavish lunch at its Bavarie restaurant. I peruse the latest BMW, Mini, and Rolls-Royce models including the ultra-luxurious Wraith. At BMW Welt, new owners await delivery of their custom BMWs in the Premiere Lounge. A representative then goes over all the vehicle’s features before the customer drives off to the autobahn. For Americans, the European delivery program allows customers to order a BMW from the United States, and then travel to Munich to receive the new car. After driving it around Europe, drop it off at a designated location, and BMW will ship your car back to the BMW dealer closest to your home—all at 5 percent below the vehicle’s MSRP. The cost savings pay for the European vacation, and your new car makes an excellent souvenir. I make it back to my hotel, 25hours Hotel the Royal Bavarian. This upscale property is a brilliant blend of Bohemian chic and steampunk. Hipsters feel right at home here, with its old manual typewriters out for use, a swan-themed papasan that graces many an Instagram page, and mechanical dioramas of circuses that play in the elevators. The building once served as Munich’s post office. Guest rooms are bright, with beds seemingly supported by stacks of books, and basin sinks add to the throwback vibe of my room (high-speed Wi-Fi is complimentary). 25hours Hotel the Royal Bavarian opened in August 2017, and both its Asian-inspired restaurant, NENI Berlin, and its Boilerman Bar are favorite local spots. The fifteen-minute walk to the Marienplatz and city center is perhaps indicative of Munich itself. Buttoned-up Bavaria is relaxing into sophisticated fun without losing its cultural essence. Nearly 90 percent of Munich’s historic center was damaged during World War II but was painstakingly rebuilt as true to its prewar splendor as possible. After a five-minute walk from my hotel to the München Hauptbahnhof—the city’s bustling central train station—I find Radius Tours & Bike Rentals and rent a bike for the day. Cruising in one of Munich’s many bike lanes, I make my way to the Marienplatz, Munich’s city center since 1158. 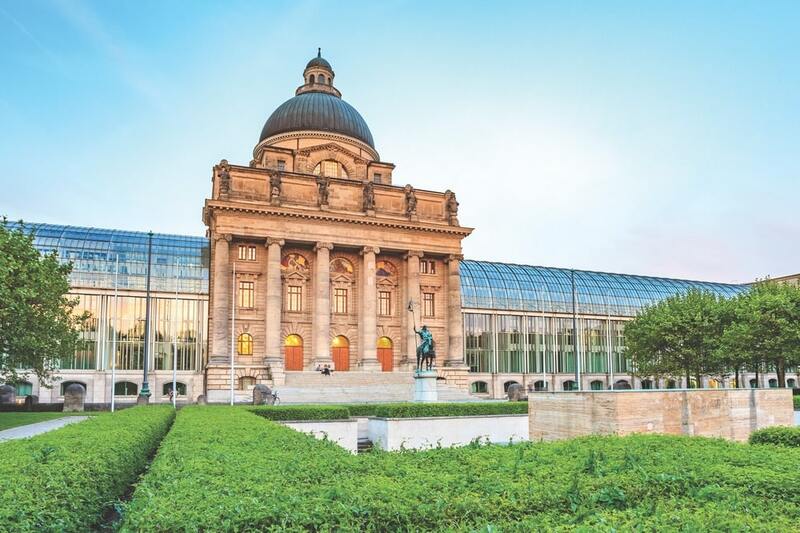 Nearly 90 percent of Munich’s historic center was damaged during World War II but was painstakingly rebuilt as true to its prewar splendor as possible. It’s a panoply of architectural styles dating from the Middle Ages through today, with centuries of renovations and rebuilding resulting in a combination of Baroque, Gothic, Romanesque, Neoclassical, and neo-Gothic architecture styles that give Munich its distinctive look. Exclusive shops fill historic spaces that date to medieval times. Reaching Marienplatz, Munich’s Old Town, I arrive in time to see the jousting figures of the famous Rathaus-Glockenspiel in the New Town Hall tower. This clock and its animated life-sized figures amaze crowds for fifteen minutes daily at 11:00 a.m. and 5:00 p.m. Built in 1908, the tower’s forty-three bells chime as thirty-two figures dance and joust in celebration of the marriage of Duke Wilhelm V to Renata of Lorraine in 1568. “Do you know the significance of the figures below the jousters?” asks a smartly dressed Münchener standing nearby. He explains that during the black plague that swept through Munich in 1517, red-coated coopers danced through the streets to signal when it was once again safe for people to come out of their homes. 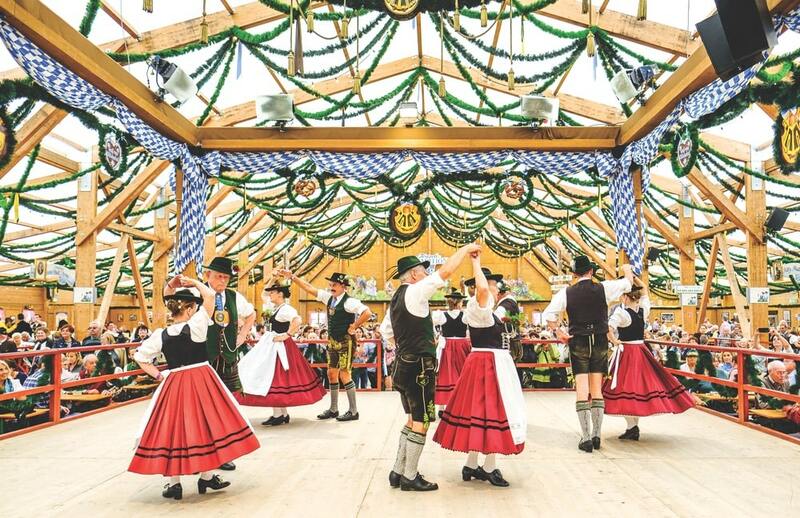 They became a symbol of spirit and perseverance, and it was decreed in 1518 that coopers perform their dance, called the Schäfflertanz, every seven years to remember this horrible time and the joy of its ending. The next dances will take place during the German carnival, from January 6 to March 5, 2019. “You’ll have to come back in a few months to see that,” he says, and I enthusiastically agree before setting off to learn more about Munich’s storied history. They became a symbol of spirit and perseverance, and it was decreed in 1518 that coopers perform their dance, called the Schäfflertanz, every seven years to remember this horrible time and the joy of its ending. In short order, I’m climbing the 299 steps through the claustrophobic stairway of St. Peter’s Church to get a three-hundred-foot overview of the city and the snow-capped Alps to the south. St. Peter’s Church stands on the grounds of an eighth-century church built by monks well before Munich’s 1158 founding. Munich means “by the monks,” and the city’s coat of arms displays the figure of a monk. The nearby Gothic Frauenkirche, completed in 1494, with its rounded double spires, is the de facto symbol of Munich. After an ongoing renovation, its south tower will also be open to visitors wanting to view Munich from above. Its interior with soaring arches was largely destroyed during the war but has been rebuilt true to its original style. On the floor of the Frauenkirche is a fun Munich myth, the Teufelstritt, the so-called devil’s footprint. This imprint of a human-looking footprint is said to have been left by a furious, stomping devil when he learned he had been tricked into financing the church’s building in 1468 by the architect Jörg von Halspach. Steeplechasing has worked up an appetite, and I make my way to Viktualienmarkt, Munich’s outdoor supermarket. Year-round stalls at Viktualienmarkt sell vegetables, fruits, flowers, and food from all over the world, but today I’m thinking local beer and bratwurst. The beer garden here is shaded by leafy chestnut trees, as all of Munich’s more than one hundred beer gardens traditionally keep underground beer cellars cool. True beer gardens allow guests to bring in their own food, and I enjoy a Maßkrug (liter glass) of lager with bratwurst and a pretzel from a nearby stall. It’s the best wurst I can remember having as I watch a typical Munich lunch hour pass by before heading to Munich’s art district, the Kunstareal. The Bayerische Staatskanzlei (Bavarian State Chancellery) houses the state government offices and is located in the former Bavarian Army Museum. 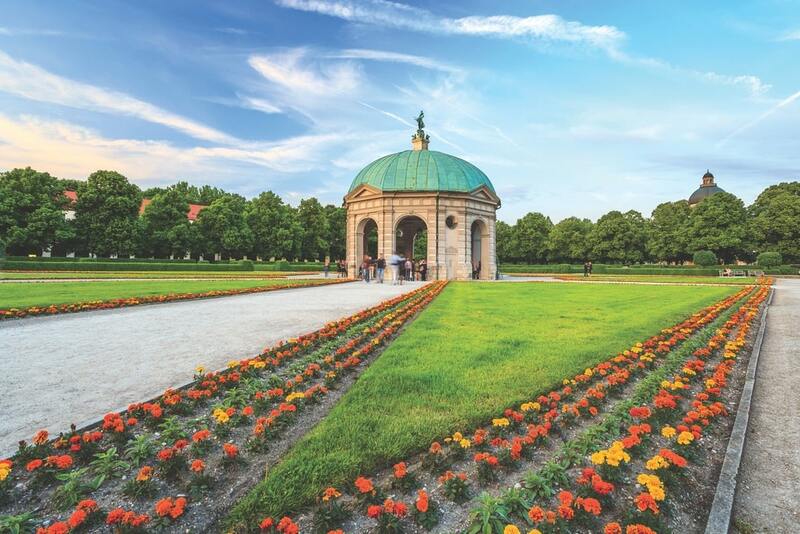 On the grounds of the Bavarian State Chancellery, take a stroll through the Hofgarten (Court Garden). The Italian Renaissance-style courtyard surrounds the Temple of Diana. Soon I’m absorbing the angular face and brilliant reds of Alexej von Jawlensky’s Portrait of Alexander Sakharoff in the Lenbachhaus museum, which displays works of nineteenth-century Munich artists. Dadaism, expressionism, impressionism, art deco, art nouveau, Bauhaus, and other significant styles that developed in the early 1900s and were either created in Germany or embraced by German artists are on display at the Lenbachhaus. Wars and governments would squelch the bold colors, abstract shapes, and angularity for their political and social undertones, but German art is once again breaking new ground and expressing a palette of ideas. 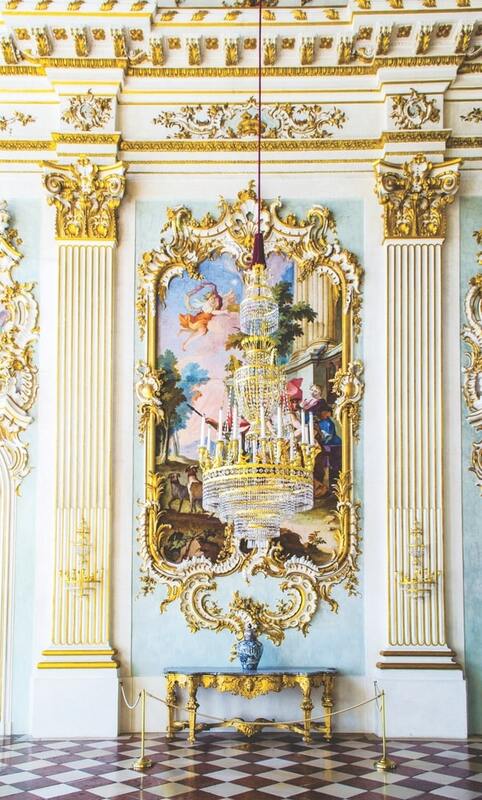 Munich has more than eighty museums exploring everything from classical art to developing new technology. A museum since 1920, the Residenzmuseum was the palace of Bavaria’s dukes and kings from 1508 to 1918, and its ornate rooms are filled with art ranging from the Renaissance through the neoclassical period. The building itself is a work of art, and though it was largely destroyed during World War II, it has been meticulously reconstructed. The fourteen halls of the Glyptothek museum are filled with Greek and Roman sculptures. Its artwork was secured during the war, but bombs hit the building itself in 1944; it reopened in 1972. 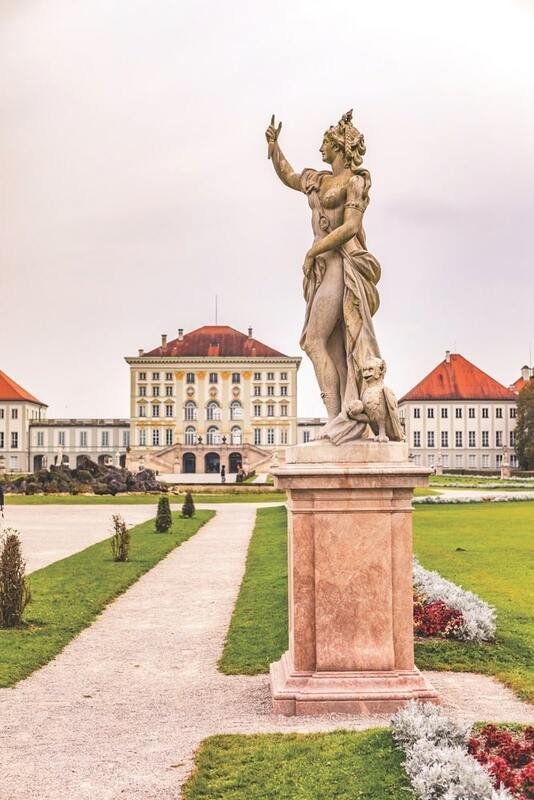 The famous Nymphenburg Palace—the Baroque summer home of seventeenth- through nineteenth-century kings, with lavish gardens—and the nearby Natural History Museum can be reached via an hour-long Tram 17 light-rail. I opt for something a little closer after exploring the museum district and head to the English Garden. Designed by Briton Benjamin Thompson in 1789, this forty-nine-mile-long park is full of soccer fields, lakes, miles of walking trails, and four beer gardens, including the Chinese Tower, a seventy-five-foot-high pagoda first built in 1790. It oversees Munich’s second-largest beer garden, where I savor a pretzel with three types of mustard and another Maßkrug before riding past the Monopteros, a Greek-style temple to Apollo built in 1836 that is a focal point for the English Garden. Müncheners laze in the sun and play Frisbee and soccer as I peddle past, heading for another unique Munich recreation spot. The Eisbach river flows through the gardens, and in a turbulent rapid, wet-suit-clad surfers take turns dropping in to ride the wave for half a minute before plunging into the water and getting back in line. I watch a woman expertly hop into the roaring white water and expertly slice back and forth. Each bank has a string of surfers patiently waiting their turn, and I spend an hour mesmerized by the skill of the surfers and the surrealistic Munich scene. Tomorrow I’ll check out the famous Hofbräuhaus beer hall (built in 1589 and open 365 days a year) and the Deutsches Museum of German science and technology and discover Munich’s cocktail scene at the Zum Wolf bar. But for right now, I’m perfectly content just watching Munich literally go with the flow. Albuquerque-based travel journalist Steve Larese also writes for National Geographic Traveler, the Travel Channel, and other publications. Follow Steve on Instagram at @SteveLarese.